Who was Sir Thomas White? Portrait of Sir Thomas White by "Sampson the paynter" (1597). In the collection of the City of Oxford. Sir Thomas White was born in Reading, Berkshire, in 1492, the son of William White. He was brought up in London and apprenticed to Hugh Acton, a member of the Merchant Taylors' Company. Acton left him Â£100 upon his death, and Thomas White used this money to begin business for himself in 1523. Thomas White became master of the Merchant Taylor's Company around 1535. In 1542 Thomas made his first benevolent gift to the city of Coventry for the purchase of park land. In 1545 he made a loan of Â£2000 to the city of Bristol. By 1547 he became Sheriff of London. The reign of Lady Jane Grey followed six years later during which time Thomas' loyalties lay with the Roman (or Marian) side, and this loyalty was apparently repaid by his election as the Lord Mayor of London on 29 October, 27 days after being knighted by Queen Mary I. On the 19 August 1554 he received Philip and Mary at their entry in state into the City of London. In 1559 he purchased Gloucester Hall, Oxford. Thomas was one of the founders of the Merchant Taylors' School and also founded St John's College Oxford. 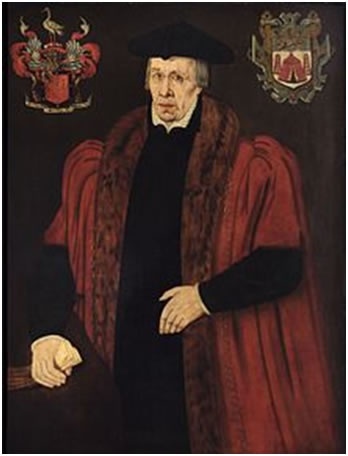 In the year 1562 he suffered greatly from a recession in the cloth trade, and as a result of this he died a poor man, but it seems that the provisions of his will were very astutely managed by his executor, the then Master of the Rolls, Sir William Cordell. Thanks to this, he bequeathed his fortune to buy land. The profits made from renting this land were to be given to young men in Leicester, Coventry, Nottingham, Warwick and Northampton. Each year a small number of men, originally four, were given a sum of money to set themselves up in business or provide education. They had nine years to pay back this money, and no interest was charged. He died on 12 February 1567 and is buried in St. John's College chapel, and although twice married to Avicia (died 1558) and Joan he left no issue. It is said that several portraits of Sir Thomas White are in existence, but it is doubtful if any of them were painted from life. The one in St. John's College is said to be similar to those belonging to the Merchant Taylors' Company, to Leicester and to nearly all the towns to which he left benefactions. Who were Henry & Elizabeth Lineham? Henry Lineham was born in London in 1851 and trained as a draughtsman but changed career and joined the Pearl Assurance Company where after nine months he was given a leading position. With this position he moved to Cambridge and took charge a division of over 600 people. Success in this led to the creation of a Northampton district branch and Henry Lineham was made Manager. He soon became involved in Northampton life. He was interested in the work of the British Legion and during the First World War he organised motor drives, which thousands of wounded soldiers enjoyed, in his capacity as Motor Transport Officer for the Northamptonshire Voluntary Aid Detachment (VAD). He was fond of making hot air balloon ascents and was also one of the first motorists. He sat on Northampton Town Council before the First World War, after taking part in several contests. In 1908 he was beaten by seven votes in the Kingsthorpe ward by sitting member Mr G W Beattie. Henry Lineham’s generosity extended in many directions but one of his main interest was in supporting the welfare of the Northampton Boy Scouts. His involvement came about after he was travelling on a tramcar at a South Coast resort and some Scouts with the words ‘Northamptonshire’ on their hats boarded the same car. Henry Lineham asked the Patrol Leader where they were from and he said ‘Northampton’. Living in the town Henry Lineham was naturally interested and as the circus was visiting Northampton at that time he asked if the boys had seen it. When they said they had not he took the necessary money from his pocket and offered it to the Patrol Leader to take them. To Henry Lineham’s amazement the Patrol Leader refused. He was so impressed by this action that he decided to find out more about the Northampton Scout movement on returning home. He then became a supporter of Northampton Scouts and was made President of Northampton Boy Scouts in 1930. As part of his generosity he purchased and presented them with a gift of 14 acres of ground at Blackthorn Wood and afterwards installed a swimming bath 70 feet long and 30 feet wide with dressing rooms at one end and seats either side. Later that year in November Northampton Boy Scouts presented him with a morocco bound gilt-edged volume containing the signatures of every Scout in Northampton – over 1,000 of them. In 1931 when Henry Lineham celebrated his 80th birthday he celebrated it at Christmas by sending Â£1 notes to 80 needy and deserving cases through the Benevolent Committee of the British Legion. Henry Lineham died on 19th December 1932 (aged 81). The Northampton Chronicle & Echo reported that he had been ‘ill for a considerable time in a Northampton nursing home and recently underwent an operation’. The Henry & Elizabeth Lineham Funds were set up under the will of Henry Lineham on 21st June 1962. Of Elizabeth Lineham (Henry’s wife) little is known.